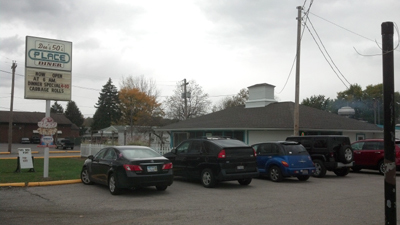 Driving through Barberton last week we passed the spot we had eaten at almost two years ago, Uptown Deli. We have driven past a number of times but have never glanced out that side of the car when on that street, worried that we may re-experience our first and only trip. Shame. What caught our attention was a new sign. For a new restaurant…even better. The second thing to strike me was the number of cars in the parking lot. A bunch. Okay, here we go again. 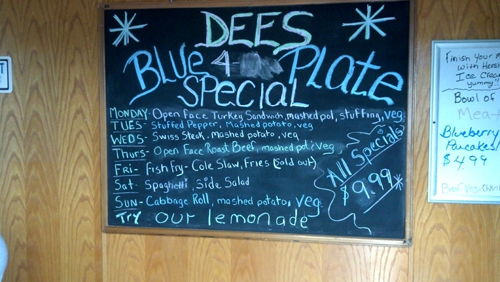 I will try to meter my happiness over something having replaced Uptown Deli and take Dee’s 50’s Diner on its own merit. The lot is full again on our return, as is the updated (or backdated) dining room. The new digs are very turquoise and white…I’m thinking like a nice 50’s convertible? The walls are covered with era posters and pictures…Rebel Without A Cause, Johnny Cash, Buddy Holly, etc. 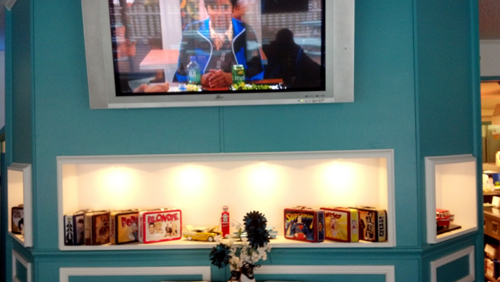 In a bit of a clash a flat screen television is showing episodes of Big Bang Theory directly over inserts stuffed with period lunch boxes like Superman, Betty Boop and John Wayne. We hit the split between late breakfast and early lunch and while most folks seemed to be enjoying breakfast we went the lunch route instead. 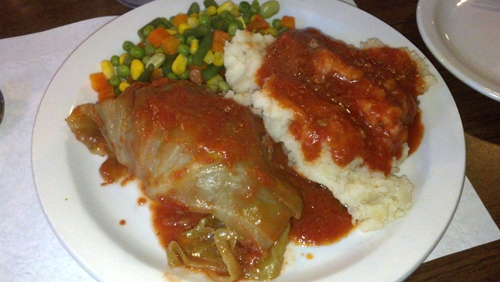 I’ll tell you now we decided we would come back for dinner even before we ordered…meat loaf and a daily special of cabbage rolls…we were in. Back to lunch. 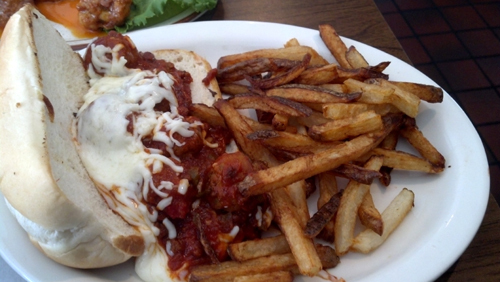 We ordered wings, chili, a burger and the meatball sub special. First a word about the service at lunch. It weren’t pretty. Nor efficient for that matter. Our server while nice, seemed a little delirious and some of the more simple tasks seemed a special challenge for her. She also seemed new, or maybe the whole place is so new as watching her try to handwrite the tab while knowing none of the prices turned out to be quite fun. The manager/owner stomped by and checked in on us in a very brusque manner. She seemed sincere but might be described as underpolished. All in all, the service wasn’t super…but like a Rube Goldberg machine…is sorta fun to watch, even if it doesn’t work all the time. 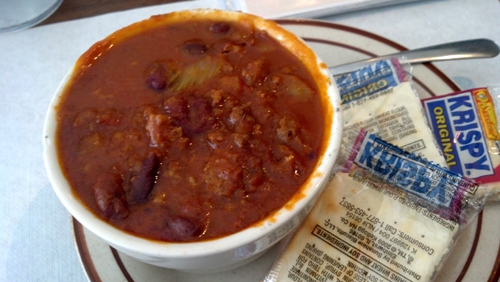 The chili arrived first. It was under seasoned to my palate but it tasted superbly fresh. The ground beef, the green peppers, the onion, it all had a whiff of garden to it that was actually nice. The wings and sandwiches quickly followed. 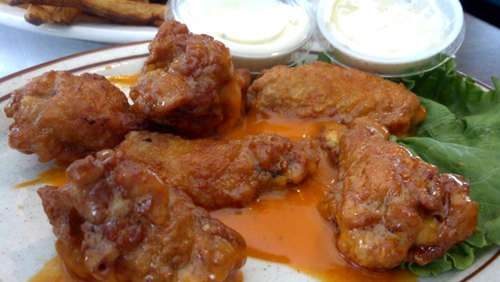 The wings were of the mild variety and they, like the chili, were pretty mild. Not bad. Strong bite of vinegar, hints of spice, they were alright but I would likely try something more assertive. They may be taming the menu overall which would be helped by having some spice adjustment available on the table. 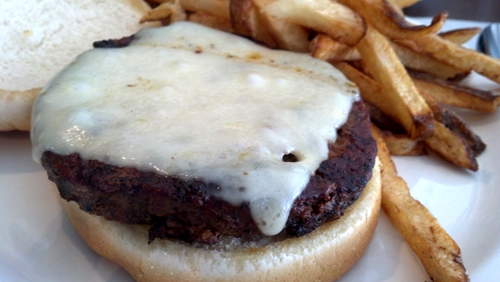 The burger tasted perfectly average as did the meatballs. The sauce on the sub also had a dose of green pepper which boosted the overall flavor to some degree. Much of the plates weren’t overly hot when they arrived at the table which was a disappointment (note: the wings and the chili were hot upon arrival). The best things on the plates were the fries. They remind me of Jib Jab’s in Girard. Fresh cut, skin on, just past GBD (Golden Brown and Delicious) they were brown and delicious. We did return for dinner and found a whole new crew manning the ship. They were much smoother at night, showed the same interest, were more efficient and had a friendlier vibe about them. I hadn’t really thought it through, but our quest for home style diner food had us essentially ordering the same dinner…mine just had cabbage. 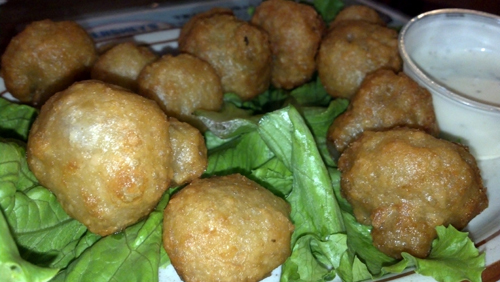 We started with fried mushrooms and Steph’s meatloaf came with a salad. 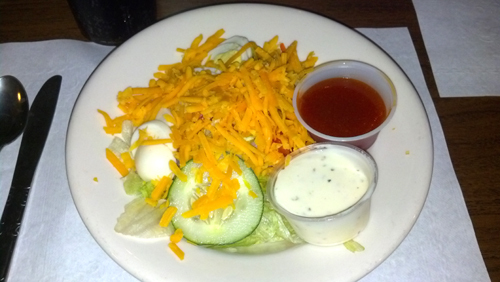 The salad had veggies and eggs along with the lettuce and cheese. Perfectly acceptable. The shrooms had upsides and downsides. Hot and coated with a tasty breading they also gave up a good amount of liquid and had that bursting a hot bubble of grease reaction unless you stabbed them and drained them before popping one in. Our related dinners arrived, Steph’s piping hot, mine warm at best. Boo. 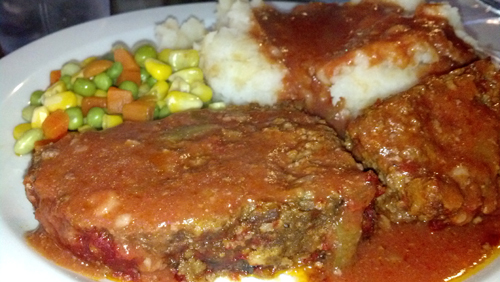 The cabbage roll and the meatloaf were both meaty, the same medium grind texture as the burger which Steph hated at lunch but not at dinner. ?. The loaf itself was better than the version from 3Sons but I liked the spice in their sauce more. The cabbage leaf could have been clipped a little to take off much of the rib which would have made for a better bite. Real mashers were coated with a tomato based gravy. Apply a little salt/pepper (and heat to mine) and they were pretty darn good. The veggie medley was cold, cold, cold and after picking out a couple of beans and kernels of corn I left the rest. 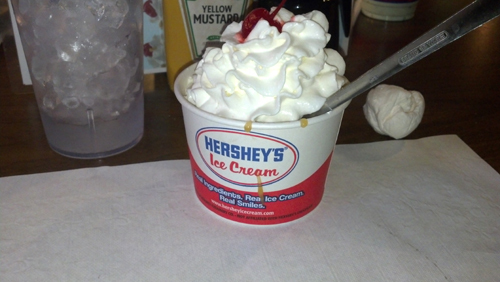 We finished with Hershey’s ice cream. 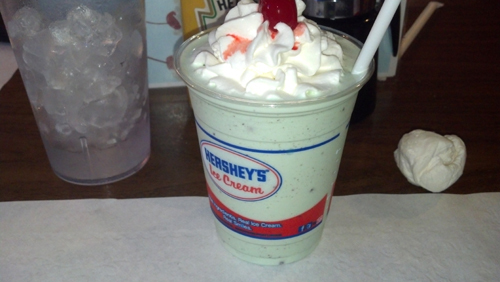 Steph got a mint chocolate chip milkshake and I a small sundae with chocolate and caramel. A suggestion. Get a scoop instead of a milkshake…the milk diluted the chocolate and mint to a serious void of either. The sundae was just what you wanted…vanilla scoop, sweet drizzles, a cloud of whipped cream and the requisite maraschino cherry and it was colder than my dinner. 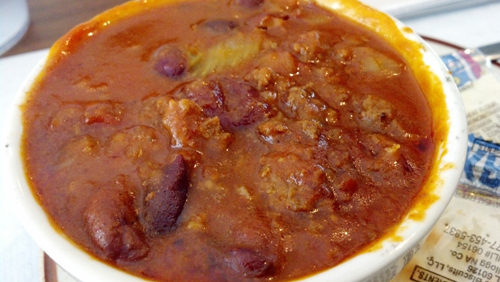 Dee’s is likely a great stop for breakfast…we will have to try. While nothing was a homerun for lunch or dinner the place does have the feel of a restaurant where you might find something on the menu you would really like, or maybe a once a week special. Nothing extravagant, probably pretty true to its 50’s archetype.